Using her older sister’s name, a young girl becomes romantic penpals with an overseas soldier. When the soldier returns, he finds that his distant lover is already engaged, but through a series of hilarious complications and plot twists, the elder sister becomes entirely convinced that her original engagement was a mistake and decides, at the very end, to marry the soldier anyway. 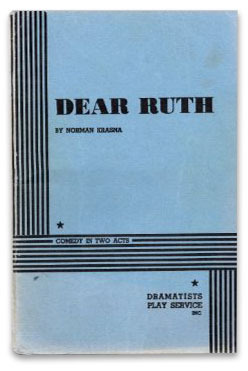 Dear Ruth was a 1944 Broadway play by Norman Krasna, later made into a romantic comedy film starring Joan Caulfield, William Holden, Mona Freeman and Edward Arnold. This comedic production was staged ‘arena’ style (theatre-in-the-round) in Falstaff Tavern, the original restaurant facility adjacent to the Old Globe Theatre. In 1969, the tavern was remodeled to become the 225-seat Cassius Carter Centre Stage. Dear Ruth. Written for the stage by Norman Krasna. Produced by special arrangement with Dramatists Play Service, New York, NY. Sponsored by the San Diego Community Theater, the City of San Diego Park and Recreation Department, and the City of San Diego.